RELEASE OF LIABILITY, WAIVER OF LIABILITY, ASSUMPTION OF FULL RESPONSIBILITY OF ALL RISKS OF BODILY INJURY OR DAMAGES: As a participant myself and/or as a parent or legal guardian of the Kelley's Dance Craze dance student(s), I give my consent for her/him to participate in the programs at Kelley's Dance Craze. I understand that participation in dance, tumbling, stretching and other related activities may result in injuries. These injuries may include muscle strains and tears, broken bones, and severe injuries such as permanent paralysis or even death. I am fully aware of the risks and, possibility of injury involved in these activities, and assume full responsibility for such risks. for the minor child or children, or otherwise guarantee payment of any medical expenses incurred as a result of training, performing, or participating in the activities of Kelley's Dance Craze. I understand that it is this dance studio's intent to provide for the safety and protection of me and/or my child or children, and in consideration for allowing myself and/or the above-named minor child(ren) to participate in activities with Kelley's Dance Craze, I waive any and all rights or causes of action against Kelley Paronish and/or Kelley's Dance Craze for any injuries suffered by my child(ren) and other damages suffered my child(ren), or myself, while under the supervision or control of Kelley's Dance Craze and its employees, staff and independent contractors. and agreed to voluntarily. I am 18 years of age or older. This agreement will remain in effect until written revocation is received. Session Tuition: I understand that this type of tuition is due, in full, by the first class of the session. Recital Classes (school year): I understand that this type of tuition is a total average amount that is broken down into 10 equal payments from September to June. This total tuition amount is figured by including holiday closings and school breaks, 5 week months, and the "June" payment, which helps to cover the cost of my child's participation in the Dress Rehearsal and Recital. There is no separate "Recital Fee." Tuition may be paid in full at registration, or be paid by the 1st of each month for ten months. MONTHLY TUITION PAYMENTS & AUTO-PAY: If paying monthly, I understand that I will pay tuition from September to June. 2) store my credit/debit card billing information in my secure parent/client portal and have tuition automatically charged each month (card will automatically be charged by the 7th of every month if payment is not already initiated by the 6th). 3) make my payment in person (or over the phone) during front desk hours via cash, check or credit/debit card. Tuition fees will be posted and my bill/statement will be emailed to me by the 25th of each month . If my credit/debit card is declined for any reason, I will be notified, and I understand that I am responsible for making the tuition payment. Annual Family Registration Fee: A $30 one-time registration fee is payable once a year from the month of enrollment; this fee is good for the entire household over the course of the dance season (Sept- June). No refunds will be made after the first class, camps, etc. regardless if the student has attended the class or not. A credit may be given in cases of a severe illness or injury with a doctor's note. Refunds before the first class will be charged a $10.00 processing fee. A $25.00 non-sufficient funds (NSF)/charge back fee will be charged for all non-sufficient fund transactions and/or returned non-sufficient fund checks. My children and I understand that joining a recital class means a ten month dance season commitment from September to June. My child is required to attend class each week, schedule and attend make-up classes (or private lessons for poor attendance) if regular class is missed too much, participate in the group class pictures (even if not ordering individual pictures) and attend the Mandatory Dress Rehearsal and Recital. Frequent absences and/or tardiness may result in the dismissal of your children from their recital classes. ANY STUDENT WHO MISSES MORE THAN 2 CLASSES WITHIN THE SAME MONTH BETWEEN APRIL-JUNE MAY BE REQUIRED TO ATTEND AND PAY FOR A PRIVATE LESSON IN ORDER TO BE FULLY PREPARED FOR THE RECITAL. ANY STUDENT WHO MISSES DRESS REHEARSAL WILL NOT BE ABLE TO PARTICIPATE IN THE RECITAL. MISSING DRESS REHEARSAL MAY MEAN PERMANENT DISMISSAL FROM KELLEY'S DANCE CRAZE. ALL COSTUME DEPOSITS ARE NON-REFUNDABLE AND COSTUME BALANCES MUST BE PAID WHEN THE COSTUMES HAVE SHIPPED, REGARDLESS IF A STUDENT HAS WITHDRAWN FROM CLASSES. I understand that I am responsible for my children's behavior and safety while on the Kelley's Dance Craze premises, including parking lots, bathrooms, waiting areas, lobby area, etc. I am also responsible for my children's behavior during class. I understand that if my children become disruptive, then they may be asked to sit out or be removed from class at the instructors' discretion. A dress code shows an elevated level of professionalism and structure. Uniformity helps students to focus on their dance training rather than on their clothing. Technical corrections and viewing body alignment can only be made with a dress code. Proper dance shoes and attire are also essential to the learning process and to avoid injury. Jewelry, gum, food, and colored/sugary liquids are not allowed (post earrings and water are acceptable in the dance rooms). Hair must be pulled back off of the face and neck for ALL classes. I give permission to allow Kelley's Dance Craze to take and post pictures and/or videos of my child(ren), or me at dance for use on the website, Facebook, in brochures and the like. All pictures and videos taken by KDC staff are property of Kelley's Dance Craze. 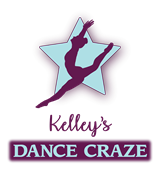 If you do not allow pictures/videos of your child to be posted, please send an email indicating so to kelleysdancecraze@gmail.com. No credit is ever given for missed classes. Missed classes can be made up on a class and space available basis. We cannot guarantee that there will be a similar class available for make-ups. All make-up classes must be scheduled at the front desk. Make-up classes must be made up within the current session (or within one month for recital classes) of the missed class(es). In the case of poor recital class attendance, 1 or more private lessons must be scheduled with the student's teacher to make-up for missed recital choreography (cost for private lessons are available at front desk). Kelley's Dance Craze reserves the right to change or cancel any class due to low enrollment. If the weather forces us to close, a message will indicate this on our Studio's Remind App, on our website and on Facebook/Instagram. The studio will close with the Walled Lake Consolidated School District for certain holidays. Check with the front desk or on the website for a schedule of these closings (closings are already figured into total recital tuition for the school year and will not be made-up).